How we love thee, One Pot Wonders, let me count the ways! Are you with me? Who doesn’t love a great meal in one skillet, the ease of clean up, the speed at which a delicious dish comes together in one place, and the communal aspect of sharing a one pot meal. Cooking up one pot wonders can put the fun back in fundamental cooking like no other method. Grab a pot and some ingredients that combine well, and add as you go! the dish I cooked up this week does all of the above and begs to be shared. 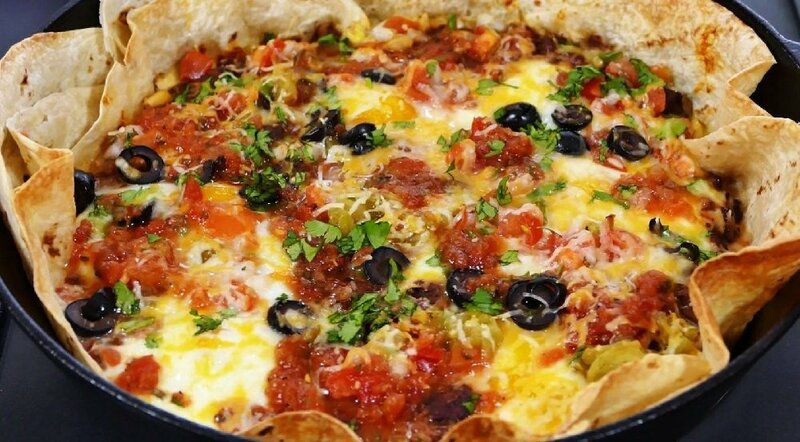 My One Pot Mexican Wonder starts with a bottom layer of flour tortillas fanned out and overlapping to look like a big flower onto which everything else is layered, nestled and sprinkled. The tortillas cook together to form a flavorful crunchy bowl, and when you lift it out, your pot is clean! My favorite thing about the One Pot Mexican Wonder is that you make it your own! Want it more spicy? Go for it! More cheesy? Why not! I guarantee this recipe will turn into one pot of wonderful! Watch my How To Video for the One Skillet Mexican Wonder here!